FACTORY78: EVENT: JetOutCyprus is an holiday package which intend to bring people together for 4days full of intriguing activities. 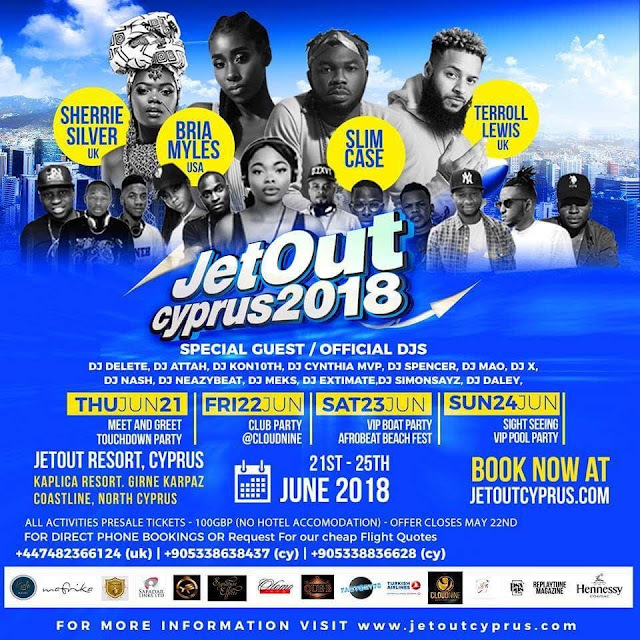 EVENT: JetOutCyprus is an holiday package which intend to bring people together for 4days full of intriguing activities. JetOutCyprus is an holiday package which intend to bring people together for 4days full of intriguing activities. This activities involve, Club party, Vip Pool party, Vip Boat Cruise, Beach Fest, Jet Ski, and Sightseeing. It is a one of a kind event that is bringing over 200people from Uk to mingle with North Cyprus people. The uniqueness of JetOutCyprus is the beauty of it’s carefully chosen Location which is one of the most beautiful holiday resort in Cyprus “(JetOut resort)”, the resort is directly facing the Mediterranean Sea which provides for a carefully carved swimming zone to make the memory of the beautiful summer a long lasting experience. JetOutCyprus is featuring various artists and dancing Queen’s, from “Slim Case( a.k.a Otunba Lamba, Saint Samiganga)”, Terrol Lewis, Bria Myles, Sherrie Silver, and a whole lots of Disc jockeys (DJ’s) form Uk and Cyprus. It’s going to be full packed of summer experience.